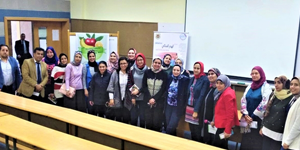 Under the auspices of Prof. Mahmoud Mohy El-Din, the President of Pharos University, the Nutrition Department at the faculty of Allied Medical Sciences launched “Healthy Campus Initiative” on Tuesday, 9 April, 2019. The coordination of this initiative was managed by Prof. Norhan Fanaky, the Vice President for Education and Student affairs, Prof. Ezzat Hassan, the Dean of the Faculty of Allied Medical Sciences, Prof Essam Ghonem, the Head of the Nutrition Department, Dr. Amany Salama, a lecturer in Therapeutic Nutrition and Dr. Naglaa Mohamed, a lecturer in Nutrition. This initiative aimed at highlighting the profound impact of nutritional knowledge in eradicating health illiteracy. According to the findings of the researches conducted last year which showed low health and nutrition literacy, the main objective of the present study is to raise the students’ nutritional and health awareness. This will be achieved through informing the students of the basic nutrients, their sources and functions as well as promoting conscious eating habits by using models of dietary guidance systems and healthy eating; traffic light system and healthy eating pyramid.